This week local MPs from across the Thames Valley area met to discuss the ongoing problems on the railway. 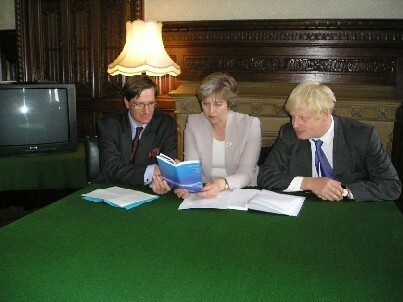 Theresa May, Boris Johnson, Dominic Grieve, Rob Wilson, Adam Afriyie and John Redwood are united in their determination to improve the current substandard service constituents face on a daily basis. As a result of this meeting local MPs tabled an Early Day Motion highlighting their concerns and calling on the Government to address this issue as a matter of urgency. Recognises the vital role that good transportation links play in the economic and social life of communities in the inner Thames Valley; expresses deep concern over the current level of services provided by First Great Western in the inner Thames Valley on both the mainline and on the Maidenhead-Marlow, Twyford-Henley and Windsor-Slough branch lines; notes that the Government’s decision to give priority to long distance inter-city services has been at the expense of services in the Inner Thames Valley; understands that the vast majority of passengers require regular fast or semi-fast trains not slow stopping services; is opposed to the Government’s plans to re-designate local branch lines ‘Community Railways’; is concerned by the potential impact that Crossrail could have on mainline services; and calls on the Government to ensure that the specification for the new Greater Western Franchise takes proper account of the needs of the Inner Thames Valley. I’d like to see a pic of Melissa. Is there a link here somewhere? Not wishing to be rude Nora, , but you still haven’t blown the gaffe about your blog site, and now you want a pic from Melissa. Is this on a quid pro quo basis? BTW, I have to ask:- is Howth Head the name of a place, , mentioned elsewhere , as you waved at Boris , or a lisping enquiry after the health of someone who had overindulged in the poteen? I think that if the Conservatives are looking for a new leader, then they need look no further than this webpage. Keith, it is very nice of you to suggest that, but I am not even a member of the party. Thats a very nice picture. Who is the blonde haired man? My name is Daniel Honey and I think I’m Boris Johnson. Ok, Nora I’m taking you on trust. Now is there any reason why you should not reveal your URL id? Leah has a tiny face and I have a hairy back. Leah puts her hairy face on my back and I scream oooooooooooh Boris!!! what’s all this about the New Media Awards in The New Statesman? Hello I’m Amy and I would like to be a smelly nurse. I have small shoes because I’m a bad bad girl. Hi Amy, why do you want to be a SMELLY nurse? Nurses do great work and you should be ashamed. Never type here again. I’ll be emailing your details to Boris for immediate action. hi i am the real Amy. nurses are certainly not smelly it was a joke. phew! what a relief Amy – you had me worried for a few moments. My name is linked below. Vicious Scurra, I didn’t mean you, I meant a more mature, quick-minded person; someone who could out manoeuvre Tony Bliar and gang……yes…..MELISSA! I’ve laughed myself off my chair at comments on blogs, on occasion. The wit abounds. However, I tried arguing on Republican blogs in the US and had enough mud thrown at me to build a clay and wattle hut in Connemara. This is terrific. No less than 27 consecutive off-topic comments in the space of 24 hours! Is this a blogging record? As usual Vicus comes perilously close to being relevant but pulls back just in time. Interesting that he lives in northeast Hampshire and claims not be a member of the Conservative Party. What is the URL for the ‘Melissa Tangos’ video clip? I’ll be reading more, just as soon as I clean up the tea which got sprayed all over with my laughter. I highly recommend logging onto a Republican message board and winding up the rednecks with their animated gun logos. Like Nora I’ve experienced the most extraordinary (and badly spelled) abuse along the lines of Go Back Where you came From, Commie Scum, which I thought was a tad unfriendly of our American chums. Shoulder to shoulder and all that. Decorum. BTW nice site. Please feel free to visit. Perhaps if the public owned them Boris old chap, then they’d be running better. Kind of how South Eastern Trains are beating out the privately owned bunch.